The man who rebuilt the New York Yankees into a sports empire — through a combination of bluster and big bucks — has died. 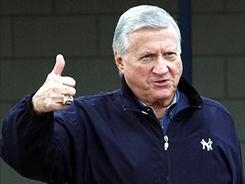 George Steinbrenner was 80 years old. A person close to Steinbrenner says he had a heart attack and was taken to a hospital in Tampa, Fla., where he died this morning. For more than 30 years, he lived up to his billing as “the Boss” — a nickname he earned and clearly enjoyed as he ruled with an iron fist. He was known for feuds — including his firings of manager Billy Martin, and his clash with Yankees great Yogi Berra. Steinbrenner was in fragile health for years, resulting in fewer public appearances and pronouncements. His sons Hal and Hank took over the operation of the family businesses.